For five summers a young Sir Neville toiled on this ‘pastoral land of Shropshire’ as the school’s assistant cricket coach. He wrote of his labours, “When the field lay empty I would gather the stumps from a dozen pitches and carry them in sheaves in my arms, a solitary reaper in the evening sunshine.” He certainly sounds like a man happy with his duties, which mainly involved bowling at the ‘young gentlemen’ in the nets. 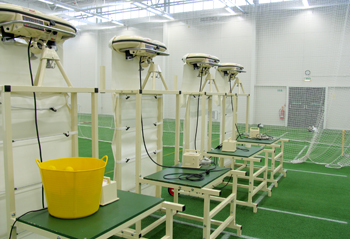 What would he make of the shinning, £2.2 million, purpose built cricket centre and its row of equally shinny BOLA bowling machines that arrived last October? 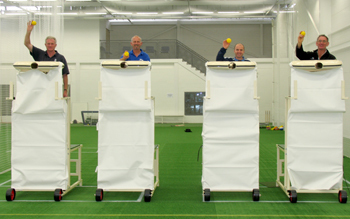 The Cardus Cricket Centre contains four lanes of floodlit ‘Supergrasse’ (the same surface that is used at Lord’s indoor school and the ECB Academy at Loughborough) and classrooms complete with the latest video coaching software. The four new BOLA machines were supplied on BOLA stands which are designed for ease of use and drastically reduce set-up time. 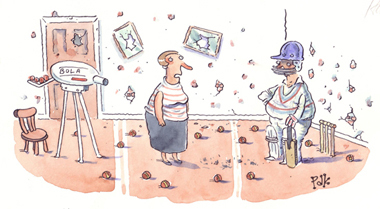 ex-Worcestershire seam bowler, who is also a keen advocate of the machine and uses BOLA HiViz balls to acclimatise his better players against short pitched bowling and also uses the machine to groove shots with all age groups in the school. 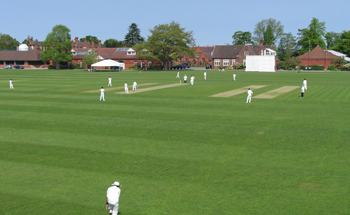 Shrewsbury school also owns two older machines that are still providing 'Cardus like’ services in the four artificial and 24 grass outdoor nets. - This cartoon appeared in Private Eye 2007.